I almost forgot to put together a post today! I don’t know if I forgot it was Friday or just had too many other things going on. 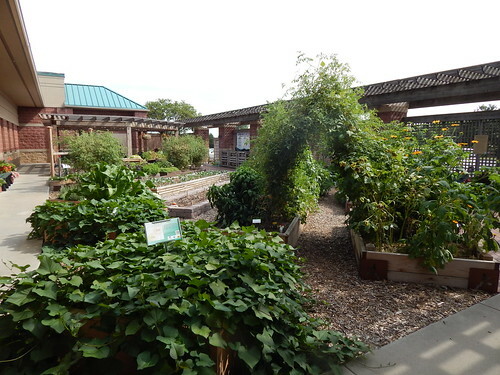 The crazy tomato trellis, the sweet potatoes, and the sunflowers continue to hog the foreground of this view of the garden, although there’s a lot going on from the other side too. From a distance, everything is still looking great, although as you get closer things look a little more tired. I suspect that by a month from now, things will have changed drastically. 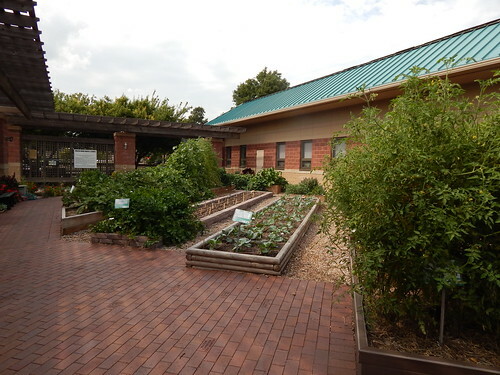 As you can see, the broccoli, cauliflower, and cabbage are growing really well, as are the parsnips. The tomatoes and eggplant still look crazy, but they are definitely slowing down. 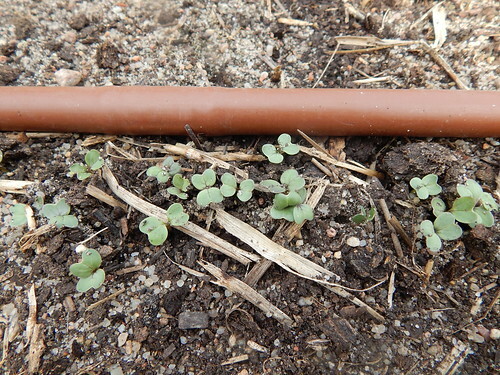 The turnips and fall radishes that we planted on Tuesday are already coming up! That’s a good sign. The beets, carrots, and spinach we should expect to be a little bit slower, but hopefully there will be some seedlings by next Friday. 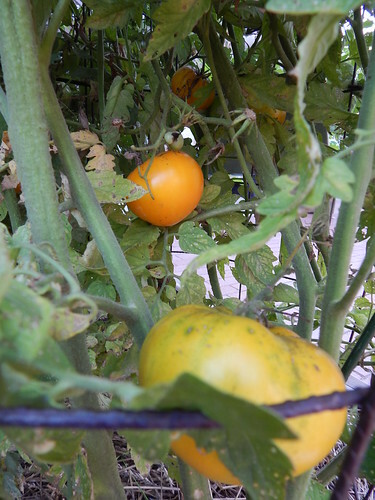 After a couple weeks of only a few ripe tomatoes here and there, we suddenly have a whole bunch of ripe tomatoes again. I’m very impressed with the ‘Limmony’ heirloom. 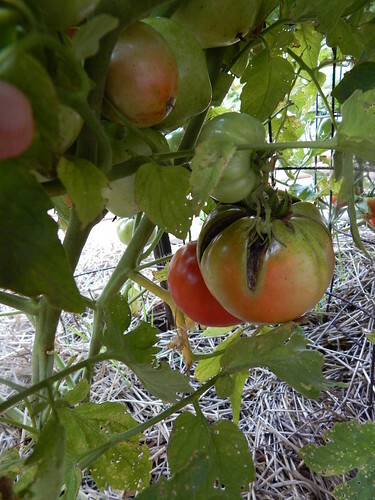 It had several ripe tomatoes on it this week, and there are virtually no cracks on them. In contrast, the ‘Bella Rosa’ tomato has a lot of fruit set, nice large fruit, but such ghastly cracks that the tomatoes are virtually rotten before you pick them. As bad as some of those cracks are, even if we picked the fruit at the pink stage it would still be rotten by the time we wanted to use it. The thyme garden is looking stupendous at this point. There are some very interesting differences in color, height/growth habit, and size of leaves. I just hope that the taller ones don’t completely choke out the shorter ones. 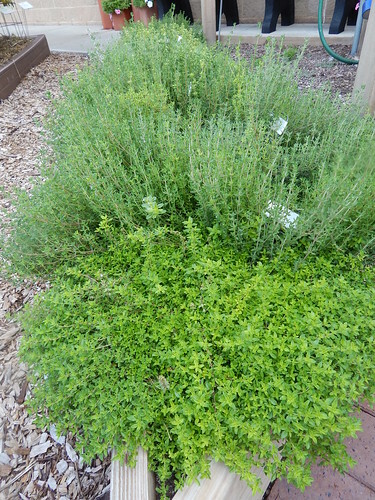 The bright green variety in the front is the ‘Lime’ thyme. The thyme is so nice, we’ve been contemplating adding it to the docket for Saturday Sampler next month. I was trying to get a picture of one of the cabbageworm moths flitting around, but ended up just getting this picture of the ‘Deadon’ cabbage. I know it’s not a very inspiring name, but the plants look great! 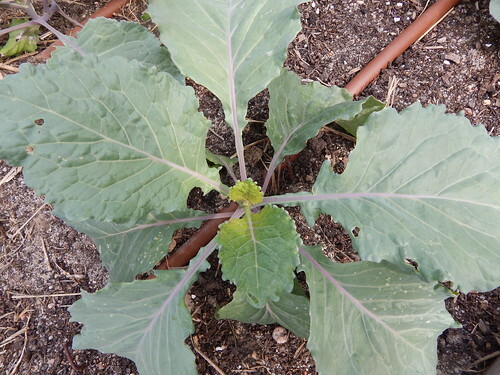 This is the cabbage that is supposed to be red-green with savoy leaves. You can just see the faint hint of red right now. With the moths already flying around, we will be trying to be very proactive to keep the munching caterpillar hordes at bay. 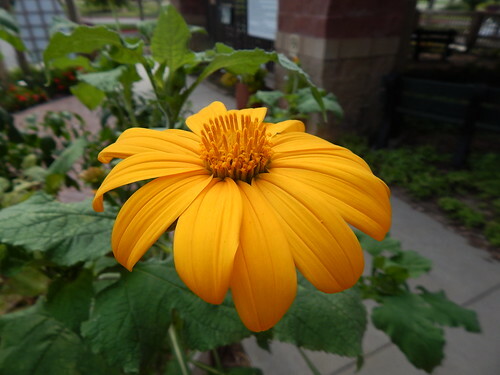 The ‘Aztec Sun’ Tithonia in the Kids’ Snack Garden (this one isn’t a true sunflower) is blooming and looking great right now, although the plants are tall enough that we don’t see the flowers quite as well. Posted on August 23, 2013, in PhotoEssays and tagged cabbage, fall garden, flowers, herbs, insects, radishes, thyme, Tomatoes, Turnips. Bookmark the permalink. Leave a comment.